Siding Painting, Charlotte, NC | Pride Painting, Inc. Whether you’re looking for siding painting or other painting services, we’re here to help. Siding is an important component used on the exterior of both commercial and residential structures. It provides insulation, which can improve energy efficiency and maintain a comfortable indoor atmosphere, as well as protection against the elements. The siding on your home or business can either enhance or detract from its appearance. Vinyl and aluminum siding are some of the most popular styles used today, but even these can make the building look run-down and poorly maintained when they start to wear out. If your siding is showing signs of wear, you have two options. The first is to replace it, although this will be an expensive and time-consuming process. The second, more economical option is to have the siding repainted. 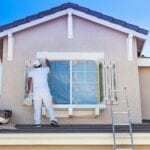 At Pride Painting, Inc., we offer siding painting services to customers located in and around Charlotte, North Carolina. We use high-quality paint and primer that can withstand the elements and keep your siding looking nice. A fresh coat of paint on the siding will refresh the appearance of your building, helping it to look like new again. Best of all, the cost is much more reasonable than tearing off and replacing the siding. At Pride Painting, Inc., we have been serving customers in the area for more than 14 years. We have an A+ rating with the local Better Business Bureau chapter, which showcases our commitment to our clients. Whether you’re looking for siding painting or other painting services, we’re here to help. Give us a call today to get an estimate for the painting you’d like done at your home or business.